Barbara Bush didn't bite her tongue in recent years when it came to Donald Trump: She just didn't like him. But a new biography of the former first lady finds that her disdain for the Republican president, who transformed the party her own family had embodied for generations into his likeness, dates as least as far back as a 1990s diary entry. Mrs. Bush, who was 92 when she died last April, gave Susan Page, author of "The Matriarch: Barbara Bush and the Making of an American Dynasty," access to volumes of her diaries, which she began keeping in 1948. The former first lady recounts in a January 1990 entry about reading a news article on Trump speaking at a Los Angeles charity awards dinner for Merv Griffin. Former President Ronald Reagan and his wife, Nancy, attended the gala, and Trump needled the former president over pricey speeches he had given in Japan. Page, the Washington bureau chief for USA Today, also reveals that Mrs. Bush blamed Trump for causing her "angst" during the 2016 election — she called it a "heart attack" — and leading her to question whether she was still a Republican. Asked in the months before she died whether she still considered herself a Republican, Mrs. Bush answered: "I'd probably say no today." 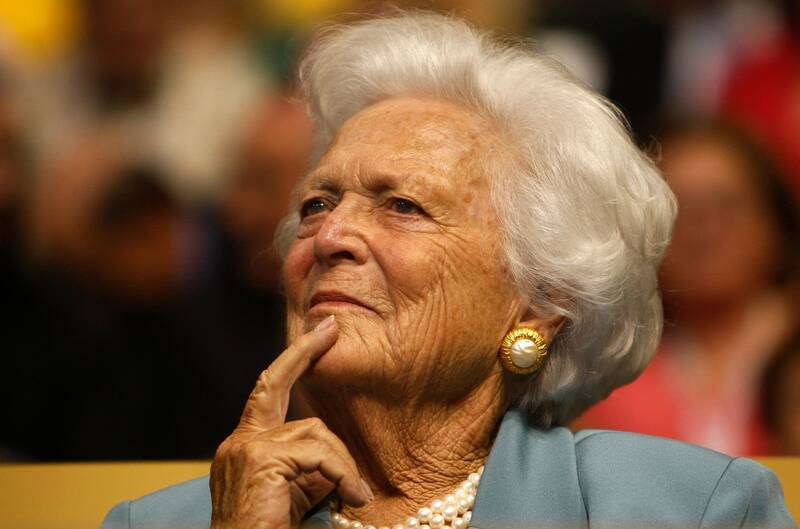 Mrs. Bush, who had been living in constant pain, fell and broke her back shortly before she died. In the hospital, after receiving the news that she was dying, she asked her doctor to keep it a secret. Once back at her Houston home, receiving only palliative care, she sat in the den holding hands with her husband of 73 years. They had the longest presidential marriage in U.S. history. He gave "Bar," as he called her, permission to die, and she gave her then-93-year-old husband permission to live.